There’s a story worth knowing about behind each of my dad’s poems, and over time I plan to tell them all in this blog. To get things going, I wanted to start with a real piece of history – part of his world that you just don’t find anymore – at least in Britain. Most working class villages in central Scotland before and even shortly after the second world war employed a “Chapper-Up” – a human alarm clock who would know all of the workers homes in the village, when they had to be out of bed to get to work or catch their bus, and would go around “chapping” – that is knocking to all non Scots reading this – loudly on their doors. You still find the equivalent of the chapper-up in some other countries – take a look at Rashid Malik and others in Kashmir who have being doing the same thing for years, in this case mainly around religious festivals..
Now some of you will be thinking, surely these people had normal alarm clocks? Well, many of them did, but what was different then was the importance of not missing that bus to work. Losing a days wage, or even losing your job, was something most families wanted to avoid at all costs. Unlike normal alarm clocks, you couldn’t ignore a chapper-up, even if you wanted to – not least because a good chapper-up would not move on until the person was out of bed. On the rare occasion someone refused to respond (something that would tend to correspond to a previous night spent too long down the pub), the whole village would know about it soon!. Once you were out of bed, they would stay around to update you on the weather, and any local news and gossip – including the latest on lazy neighbors who hadn’t budged that morning. So really the job spec went way beyond the alarm clock bit, taking in the additional roles of the free local newspapers and morning radio! Calderbank’s best known chapper-up was old Micky Morris. Read the poem and you’ll feel like you’ve got to know Micky pretty well! The short quote below shows how old Micky didn’t give up easily! The demise of the Chapper-up captures for me something about technology, something about relative affluence and attitudes to work, and something about the changing landscape of work in Britain. Less and less of us are involved in the tough, hard, shift work needed for productive steelworks, coal mines or shipyards. Less of us actually MAKE things. But I think there is something more significant that has been lost, maybe without us knowing it. At a time when some would claim technology has made communication, forming communities and generally knowing what others are up to in real time so much simpler, in a single generation we have almost lost the sort of tight knit local communities, where the chapper-up acted as one of the key parts of the fabric, – part of the glue that held things together; the kind of community and personal bonds that can only come when real people interact, something that might be simulated, but never replaced by Facebook and a bunch of i-phone Apps! Modern politicians love to talk about how we need a “big society”. It seems to me we used to have one – and no one had to invent it or feel they had to pay for it. The Big Society was just how people lived. The Knitter – both the poem and book – try to speak to that same thing – the importance of family, and others, in helping us make some sense out of our own lives. 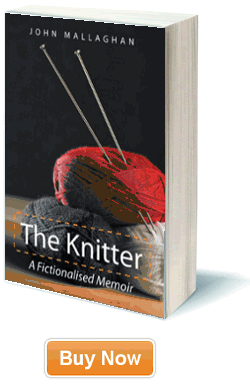 When I first published “The Knitter”, accompanied by this web site and blog, I was sent a beautiful email from an old resident of Calderbank, whom I won’t name. The email told of how this person’s grandfather had recently died, and how his grandfather had often told him as a young boy of Micky Morris, and the Chapper-ups in Calderbank. He had never known of my father’s poems, and it was obvious from the email of both his surprise to find that poem, and also how the poem would help keep the memory of his grandfather alive. Getting an email like that makes the 18 months it took to write the book worth it, all by itself. And it also confirmed for me something I’ve always believed – that great poems are the most effective way of preserving great memories. So remember, the next time you hear the ear drum piercing sound of your alarm clock, and you drag your weary frame off to the train for your next joyous commute, just wonder for a minute whether you might have preferred to start the day with Old Micky Morris waking you up, seeing how you were and updating you on the local gossip before that first cup of coffee…. Hi, i think that i saw you visited my blog so here i am!.I am trying to find things to improve my website!Is it ok if i use some of the things i saw here?! Happy New Year 2011! I would like to thankx for the efforts you have put in writing this article. I am hoping the same high-grade post from you in the future as well. In fact your creative writing skill has inspired me to start my own blog now. Really the blogging is spreading its wings rapidly. Your write up is a fine model of it. Moving and powerful! You’ve certainly got a way of reaching people that I haven’t seen very often. If most people wrote about this subject with the eloquence that you just did, I’m sure people would do much more than just read, they’d act. Great stuff here. Please keep it up. Hi Webmaster, commenters and everybody else !!! The site was completely fantastic! Lots of good information and inspiration, both of which we all need!Keep ‘em coming… you all do such a excellent job at such Concepts… can’t tell you how much I, for one appreciate all you do! I have read a few of the posts on your site these few days, and I truly like your style of blogging. I bookmarked it to my favorites internet site list and will be checking back soon. Please visit my site as well and let me know what you think. Hello your web-blog is absolutely funny!!! I am sure that I will come back to see articles!! !